On the line of the New-York Elevated Railroad is a station commonly known as the “Grave-yard Station.” It is at the junction of Ninth-avenue and Fiftieth-street, and receives its name from a little grave-yard, about 50 feet square, that occupies the south-west corner of the intersecting streets. It is some six feet above the level of the street, and is not much noticed by those on the side-walk, who see nothing but the heavy stone wall surrounding it; but from the platform of the station its handful of gray, crumbling tombstones can be plainly seen, and its forlorn and neglected condition noted. It is bounded on two sides by the streets, on a third by the high blank wall of a store, and on the fourth by a wooden tenement-house, from which a door opens upon it, and to which it makes a convenient front yard. Near this door some of the mounds have been leveled, and a patch of ground a few feet square has been dug up and raked over, so as to form a bit of a garden. Dirty children tumble and play over the other graves, and among the tottering stones, and above all, lines of newly-washed garments are blown about in the wind. No tender recollections appear to cling to the spot, and its appearance is pathetic. As the passenger on the railroad, while waiting for his train, attempts to decipher the almost obliterated inscriptions on the monuments beneath him, and questions the employees of the road, who prove to know as little as himself, he wonders that a place so neglected should be retained for its present uses instead of having been built upon long since, as has every other available plot of ground in the vicinity. He notices that on all of the stones upon which the inscriptions are legible the name is “Hopper” . . . 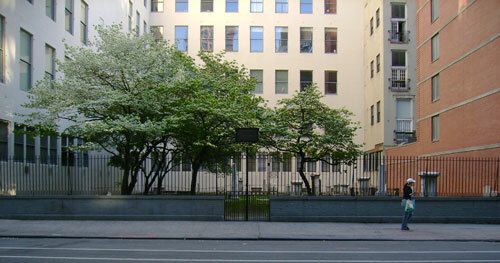 This burial ground was originally part of the Hopper farm, a large estate that extended from 6th Avenue to the Hudson River between 49th and 54th Streets. Mattias Hopper, the son of Dutch settlers who came to New Amsterdam in 1652, acquired the land in 1714 in the district that was then known as Bloomingdale. Mattias’ son, John Hopper, took possession of the farm around 1750. When John Hopper died in 1778, his will ordered that the farm be divided into six equal portions among his heirs, who entered into an agreement that the family graveyard would be reserved as a burial ground forever. The graveyard continued to be used until 1840, and members of the Hopper, Varian, Cozine, and Horn families were buried there. 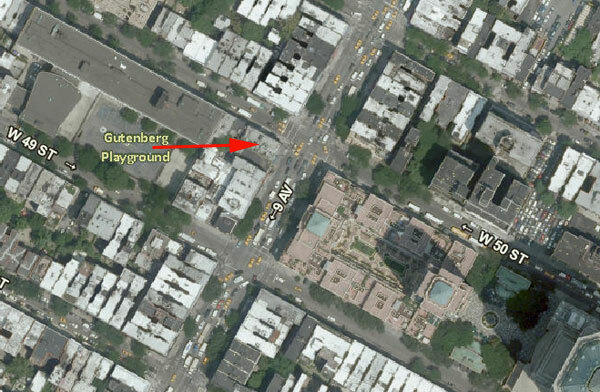 In 1846, portions of the graveyard were cut off when 50th Street and 9th Avenue were laid out to the north and east of it and the remains of several individuals were relocated to another part of the cemetery. Buildings rose on the other sides of the property, and the old cemetery was forgotten and neglected. The Hopper farm was famous for a number of 19th century legal battles concerning rights to the estate, including litigation that followed the removal of the burial ground in 1885. Ellsworth L. Striker, a Hopper family descendant who claimed possession of the property, removed the graves and subsequently built an apartment house on the site. Striker’s rights to the property were disputed, but the state Supreme Court eventually decided in his favor. Sources disagree as to whether the remains from the Hopper burial ground were reinterred at Trinity Cemetery in upper Manhattan or at Woodlawn Cemetery in the Bronx. Sources: “Some Old Grave-yards,” New York Times, May 18, 1879; “The Hopper Burial Place,” New York Herald-Tribune, April 28, 1885, p. 1; Mott, Hopper, Striker (The Historical Co. 1898); The New York of Yesterday: A Descriptive Narrative of Old Bloomingdale (Mott 1908) ; Blackman v. Striker (The New York Supplement Vol 21 1893, 563-565); 1820 Map of Land Belong to the Estate of John Hopper (Abstracts of Farm Titles…Tuttle 1881); Perris’ 1857 Atlases of New York City, Pl. 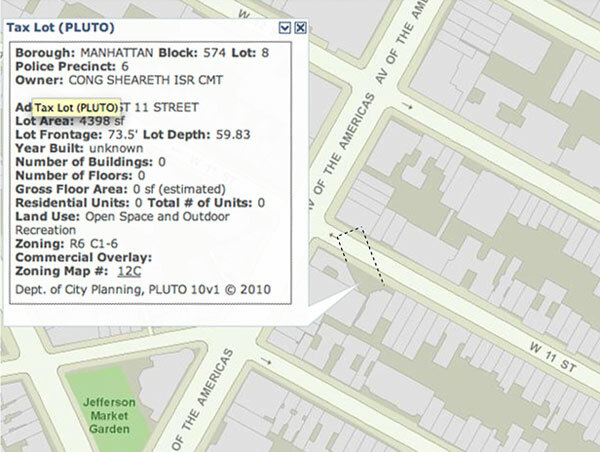 101; NYCityMap. When officials of the newly established Diocese of New York decided to build the city’s first cathedral in 1809, they selected a site at Mott and Prince Streets that was within the burying ground of St. Peter’s Church. St. Peter’s, the city’s first Catholic church, created the cemetery at the beginning of the 19th century when the graveyard around their church on Barclay Street became full. 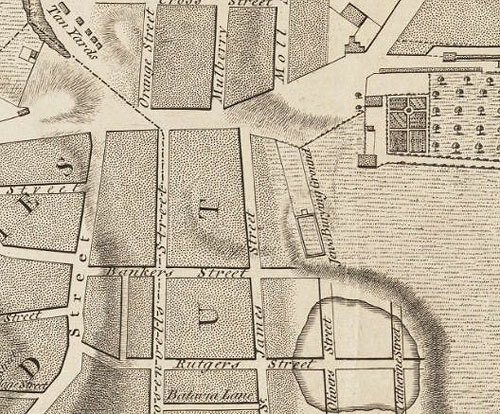 In 1801, they purchased several lots on the northwest corner of Prince and Mott streets, in the area that is now known as NoLita; an 1803 purchase of additional lots on the northeast corner of Prince and Mulberry streets enlarged the new burial ground. When a portion of the cemetery was chosen as the cathedral site, provisions were made for the relocation of any graves within the building site to other areas of the cemetery. Construction on St. Patrick’s Cathedral began in 1809 and was completed in 1815. Between 1811 and 1824, the church’s property was expanded further by the acquisition of adjacent lots, and the cemetery grew to its present dimensions, flanking the church on its north and south sides. Additionally, a network of family crypts was built beneath the church. In ca. 1830, a 10-foot-tall brick wall was constructed around the boundary of the property to protect the church and cemetery from anti-Catholic violence that was prevalent during that period. Over 32,000 burials were recorded in St. Patrick’s Cemetery between the time that interments began to be registered in 1813 until the Catholic Cemetery on 11th Street opened in 1833. The 11th Street cemetery replaced St. Patrick’s Cemetery as the main burial ground for the city’s Catholic community, but occasional interments continued in the graveyard and crypts at St. Patrick’s into the early 20th century. St. Patrick’s Old Cathedral became a parish church when the new St. Patrick’s Cathedral in midtown Manhattan was completed in 1879. The Old Cathedral was recently designated a basilica due to its historical and spiritual significance. Its cemetery and vaults hold the remains of many of the city’s early Catholics, including those transferred from the graveyard at St. Peter’s Church on Barclay Street in 1836. Most of those buried at Old St. Patrick’s are Irish, including several members of the 69th New York regiment, part of the “Irish Brigade” that fought in the Civil War. The cemetery is also the original burial site of Pierre Toussaint, a former Haitian slave who is a candidate for sainthood in the Catholic Church; his remains were moved to a crypt at the new St. Patrick’s Cathedral in 1990. Virtual tour of the cemetery and crypts at Museum Planet. Sources: Colton’s 1836 Map Of The City and County Of New-York; “The Catholic Cemeteries of New York,” Historical Records and Studies 1, 371-373; History of St. Patrick’s Cathedral; “Centennial at Old St. Patrick’s,” New York Times, May 19, 1909; “Politely, A Cathedral Battles to Keep Modern Scrawling Off a Wall’s Historic Bricks,” New York Times, July 6, 2003; “Cathedral With a Past; Basilica With a Future,” New York Times, Dec. 5, 2010. 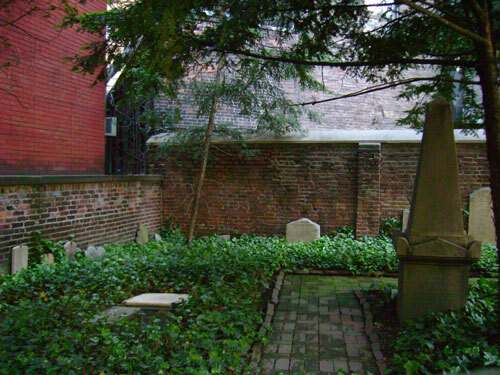 The first Catholic cemetery in New York City, and in the State of New York, was around the original St. Peter’s Catholic Church in lower Manhattan. In 1785, a group of Catholics in New York acquired an 110 x 125 foot plot on the southeast corner of Barclay and Church streets. The first St. Peter’s church, a brick building of 48 x 81 feet, was erected on the site and the remainder of the property was reserved for a burial ground. 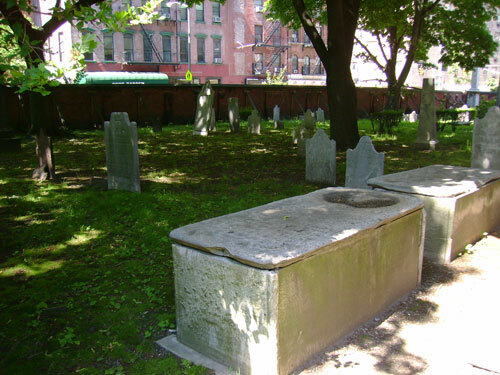 The churchyard had become inadequate by the end of the 18th century, and in 1801 St. Peter’s purchased land at the corner of Prince and Mott streets to serve as a new burial ground. Subsequent acquisitions expanded this property, which became the site of St. Patrick’s Cathedral in 1809. In 1836, St Peter’s began construction of a new, larger church on the same site as the old church and graveyard on Barclay Street. 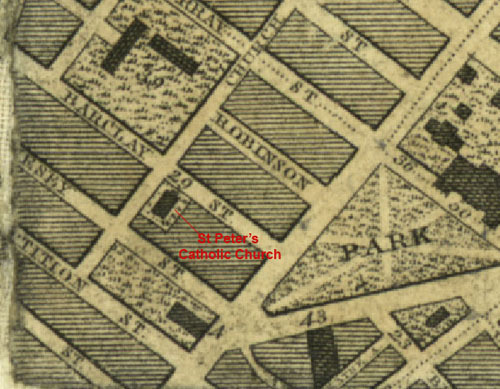 The graves in the churchyard were removed at that time, and were reinterred in the graveyard adjacent to St. Patrick’s Cathedral at Prince and Mott streets. Some remains were reburied under the new church building, which still stands today. According to a statement made by Vicar General William Quinn in 1883, remains that had been buried beneath the present church were disturbed during excavation work in the mid-1800s and were reburied at Calvary Cemetery in Queens. 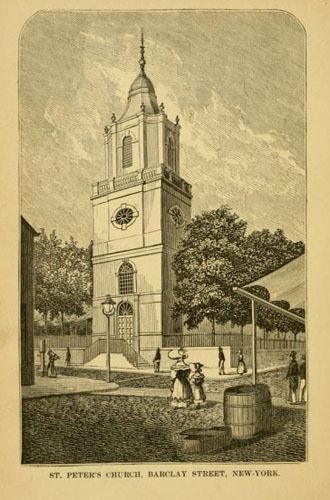 An 1831 view of the original St. Peter’s Church (Bourne Views of New York). Bridges’ 1807 Plan of the city of New-York; “The Catholic Cemeteries of New York,” Historical Records and Studies 1, 370; The Catholic Churches of New York City, 586-624; A Brief Sketch of the Early History of the Catholic Church on the Island of New York (copy of Bourne engraving); “Excited Roman Catholics: The Proposed Removal of Dead Bodies from a Cemetery,” New York Times Jan 4, 1883; “St Peter’s 108 Years Old,” New York Times Nov 27, 1893; “St. Peter’s Roman Catholic Church 22 Barclay Street” by Beyond My Ken. West of the Sixth Avenue is a large open space which testifies silently yet strongly to the time when all this part of the island was quiet country side and the city still was very far away. 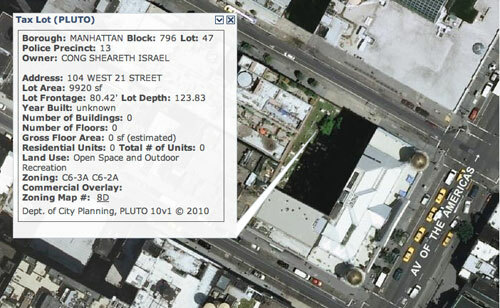 It is the Jewish graveyard—the Beth Haim, or Place of Rest . . . the Beth Haim was established here—on a lot which possessed the advantages of lying within one of the blocks of the new City Plan and therefore was safe against the opening of new streets, and which also could be reached by an already opened country road. Although long since superseded by the Beth Haim on Long Island, this graveyard still is cared for zealously—as may be seen by looking from the back windows of the big dry-goods shop on the Sixth Avenue upon its rows of seemly monuments, whereon legends in Hebrew characters tell of “Rest” and “Peace.” And, truly, looking out from the bustle and clamor of the shop upon the grassy quiet place, with its ivy-clad deadhouse and its long lines of marble gravestones whereof the whiteness has become gray as the years have gone on and on, there is a most pleasant sense of rest and peacefulness amidst this calm serenity of ancient death. (Harper’s New Monthly Magazine, June 1893). 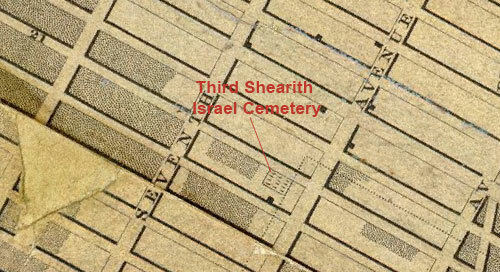 When Congregation Shearith Israel was forced to close its graveyard in Greenwich Village in 1829, it established a new cemetery in an area even further away from the city center. 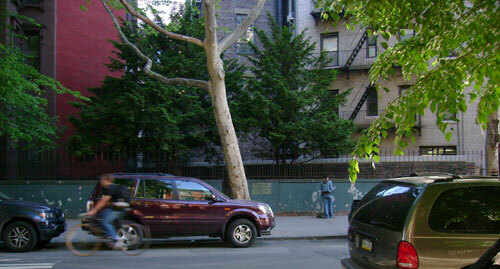 The new burial ground had a frontage of 80.5 feet on the south side of 21st Street, about 75 feet west of 6th Avenue. It was dedicated as Beth Hayim Shelishi (the Third Cemetery) in August 1829 and the first interment took place in November of that year. A Metaher house, or chapel, (the “ivy-clad deadhouse” mentioned above) was built near the cemetery’s entrance in 1830, but has long since disappeared. The 21st Street cemetery served as the congregation’s burial ground until 1851, when the city banned burials below 86th Street. An exception to this prohibition was made in 1855, when remains removed from Congregation Shearith Israel’s graveyard at Chatham Square were reinterred at the 21st Street cemetery. Today hemmed in by buildings, the cemetery has survived relatively intact and remains the largest of the three Shearith Israel burial grounds in Manhattan. The congregation is currently in the process of renovating and preserving the cemetery. See more photos of the Third Shearith Israel Cemetery. See recent renovations at the Third Shearith Israel Cemetery. In 1804, Congregation Shearith Israel purchased land in Greenwich Village to serve as a burial place to supplement its old graveyard near Chatham Square. The new property, about 50 x 100 feet on Milligan Street,* was dedicated as Beth Haim Shenee (The Second Cemetery) in 1805. When first established, the new cemetery was used mostly as a burial place for those dying of contagious diseases and for new immigrants who had no family ties to the old graveyard. 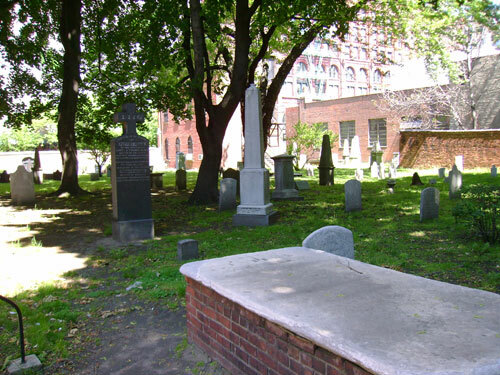 When the Chatham Square cemetery fell out of use following city ordinances in the 1820s that prohibited burials in lower Manhattan, the cemetery on Milligan Street became the Congregation’s primary burial ground. It functioned in this capacity only until 1829—in 1830, 11th Street was extended through the cemetery, leaving just a small remnant of the graveyard intact. Burials that were in the path of the street were reinterred in this portion of the cemetery, which exists today as a small trianglar plot on the south side of 11th Street, just east of the Avenue of the Americas. A few dozen headstones are still present at the site. See more photos of the Second Shearith Israel Cemetery. 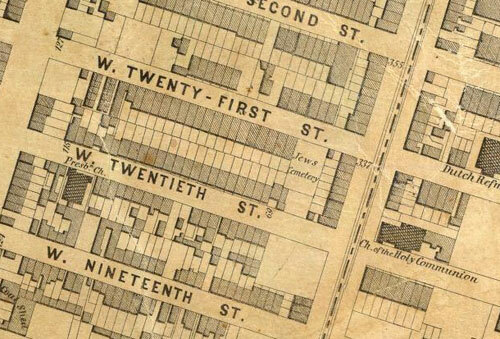 *According to Old Streets of New York, Milligan Street ran perpendicular to Greenwich Avenue from its present intersection with West 10th Street, through the southeast corner of Sixth Avenue and 11th Street, to what is now the south side of 12th Street about 200 feet east of Sixth Avenue. It was obliterated when the city’s grid plan was imposed on the area. 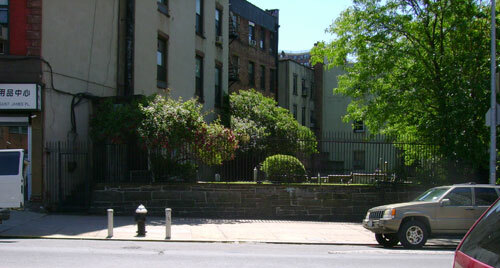 This small graveyard, on St. James Place near Chatham Square in present-day Chinatown, is the oldest surviving Jewish burial ground in New York City. It was used by Congregation Shearith Israel, the first Jewish congregation in North America. 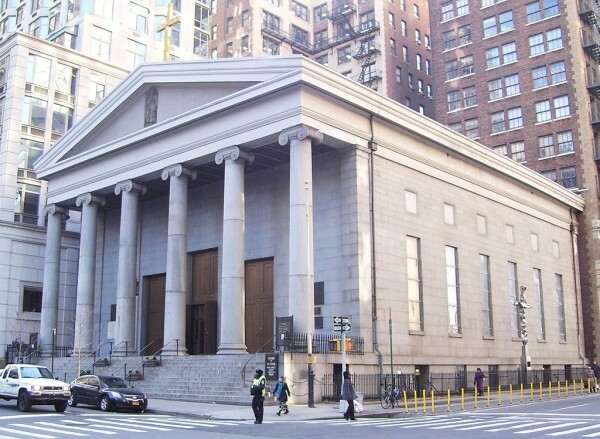 Shearith Israel was formed in 1654 in New Amsterdam by Sephardic Jews from Brazil and was the only Jewish congregation in New York City until 1825. 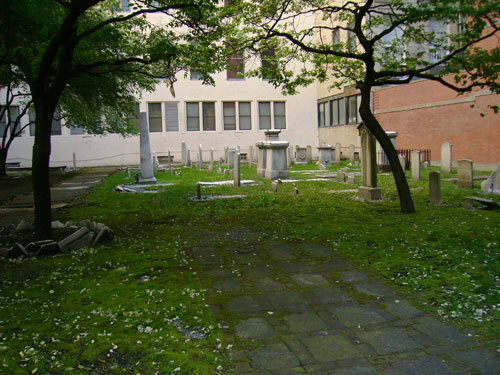 The Chatham Square graveyard is known as Shearith Israel’s “first cemetery,” but was actually the second burial ground used by the congregation. In 1656, city authorities granted the Jewish community “a little hook of land situate outside of this city for a burial place.” The location of this original graveyard is unknown today. 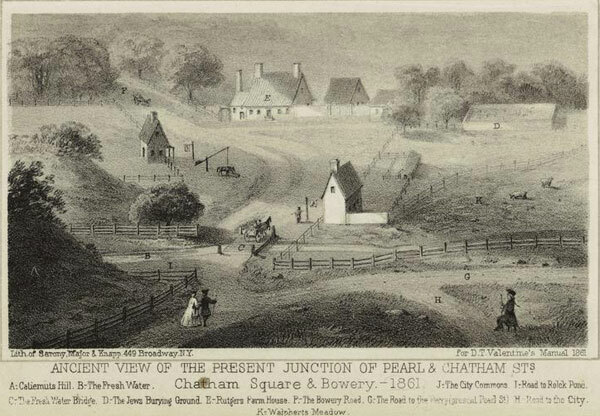 The Chatham Square cemetery was founded in 1682 and was expanded in the 1700s so that it once extended from Chatham Square over what is now the upper part of Oliver Street down to Bancker Street (present-day Madison Street). 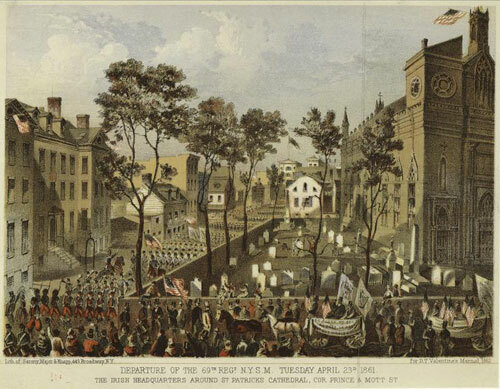 Several hundred individuals, including a number of veterans of the American Revolution, were buried at the Chatham Square cemetery before it closed in the early 19th century; the last recorded burial was in 1833. Development encroached upon the cemetery so that only a small remnant exists today. 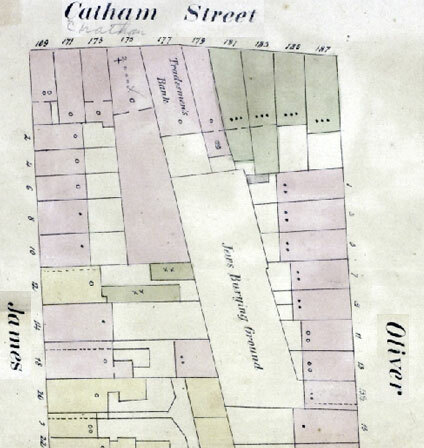 In 1823, the congregation sold an unused portion of the cemetery frontage on Chatham Square to the Tradesmen’s Bank; additional unused portions on Oliver and Madison Streets were sold in 1829. 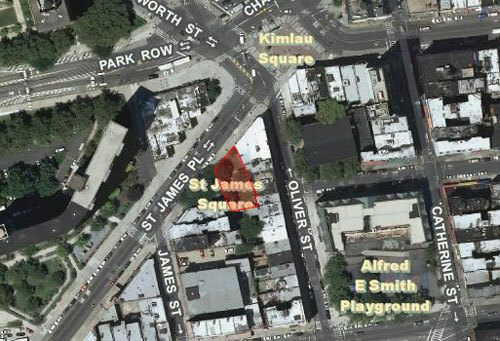 A section of the burial ground was taken by the city in 1855 when the New Bowery (today’s St. James Place) was cut through; 256 burials were removed from the graveyard at that time and reinterred in the congregation’s cemeteries on 21st Street and in Brooklyn. About a hundred headstones and aboveground tombs can still be seen in what remains of the old graveyard, which lies above street level on the south side of St. James Place. Congregation Shearith Israel continues to maintain the cemetery, and it also has an annual Memorial Day ceremony at the site in honor of the Revolutionary War veterans buried there. 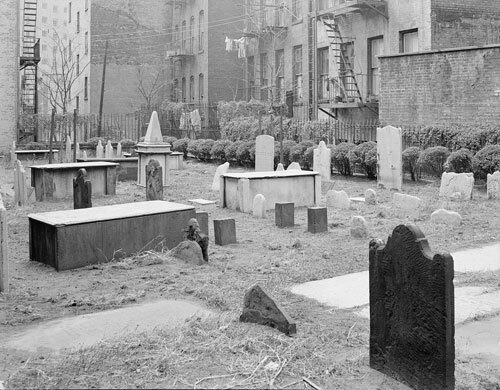 A view of the Chatham Square cemetery in 1952 (Library of Congress). View more photos of the First Shearith Israel Graveyard.